I’m a big fan of the jerseys from the folks at Elevengear (even if their website was designed to make one’s eyeballs fall out). I happily sport several of their jerseys, including the Republic of Anerobia and the Poseur jersey. I’m not a huge racer (by which I mean I’m too slow to race but many of my friends are and they’ve got their old race numbers plastered all over their houses. Wouldn’t it be great if they could do something better with those numbers? Like recycle them into a racing cap? 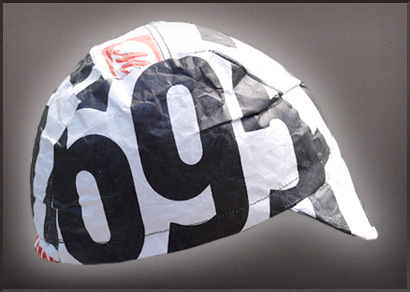 (Okay, there are lots of events that use Tyvek numbers too, and that’s all you need to get a cap made). The new Race Number Cap is their latest genius idea. I’m thinking of getting one made but using USPS Tyvek shipping envelopes. It can be my US Postal cap, if anyone gets it.